Two big trailers from completely distinct genres released yesterday. One was the much-anticipated Bollywood drama Kalank whereas the other much darker and probably DC's much-awaited Joker. There's nothing common between the two films but both set the internet on a crazy ride with their trailers. The Bollywood drama stars some big names such as Alia Bhatt, Varun Dhawan, Aditya Roy Kapur, Sanjay Dutt, Sonakshi Sinha and Madhuri Dixit Nene. Joker, on the other hand, has the phenomenally talented Joaquin Phoenix in lead and a supporting cast boasting of veteran actors such as Robert De Niro. The Batman spin-off revolves around the story of the superhero's archenemy and takes a peek at the story of the man behind the maniacal villain. Both the set of trailers received their own set of positive reactions from the fans but it was evident that the Hollywood release found much more love even from netizens than the Hindi film Kalank. The Karan Johar production set in 1945 may have magnificent sets and colourful costumes but it hardly stood competition to the Todd Philips directorial. Joker Teaser Trailer: Joaquin Phoenix Takes Us Through Arthur Fleck's Chilling Journey From a Stand-up Comedian to The Clown Prince of Gotham. 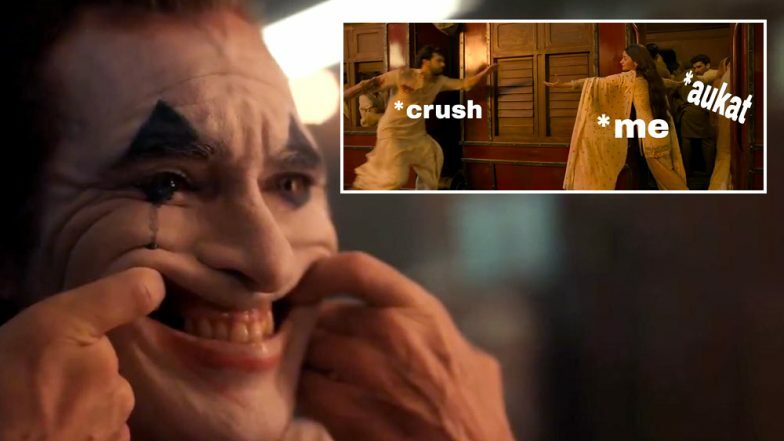 Kalank started off what one could call a 'meme fest' whereas Joker has been receiving love letters from netizens for Phoenix's amazing act and fans even believe that he's definitely making the late Heath Ledger proud. Kalank Trailer Review: Varun Dhawan and Alia Bhatt's Love Story Prevails Against The Horrors of the Partition Saga - Watch Video. Of course, there are several Bollywood lovers who liked the Kalank trailer and had many nice things to say about it, especially Alia Bhatt and Varun Dhawan's chemistry. Now, take a look at the Joker comments and you will know who's the winner! That #Jokertrailer made me cry. DC, you’ve officially gotten my attention with this one. It seemed like netizens had a field day talking about two films which are big in their own ways. While Kalank is all set to release on April 17 luckily it won't be facing any competition from Joker at the box office. Joker is slated to hit the screens on October 4.